We haven't seen much of the new Movie Maniacs in the States yet - they are just starting to hit a few stores now. 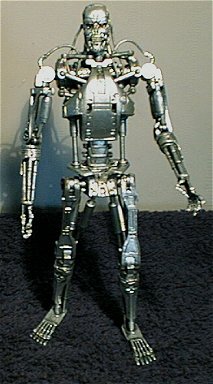 So one of my readers from the U.K. decided to help out with a terrific guest review of the new T-800 - enjoy! Hey there! 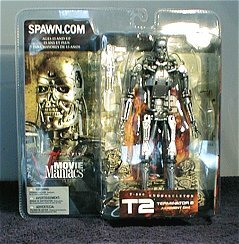 For my first ever review, I've decided to lay judgement upon my first ever McFarlane figure, the T-800 endoskeleton from the Movie Maniacs line. The 5th series should be hitting shops in the next couple of weeks and includes T-800 and Sarah Connor (in both long hair and cap-wearing variations) from Terminator 2, Jason Voorhees from Jason X, Djinn from Wishmaster, Lord of Darkness from Legend and the Tooth Fairy (who also has 2 variations - open and closed mouth) from the film of the same name. Wow. Just amazing. This is the figure I've been waiting for since the first T2 figures came out almost a decade ago. Every single detail is reproduced, down to the tubes coming out of the shoulders. The arms, torso and legs have pistons that actually work! This is about as perfect as they come, apart from one thing: the feet are far too long. They're about twice as big as they should be, although I'm guessing that's due to the fact that if the feet were the right size the figure would never stand up. Not a whole lot of paintwork, but what there is is great. The figure and gun are silver with a black wash that highlights the details and gives the figure a "grungy" look. The eyes are red, but the real surprise is the teeth, which are a yellowy-white. 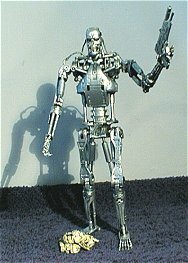 This is the first Terminator figure (to the best of my knowledge) that has this detail, and although it's hardly noticeable, it really adds a lot. T-800 comes with a gun, pile of skulls and a stand that holds a replica of the original film poster. There's not a whole lot that could have been included with this figure, but what is included is functional, if a little boring. The gun is well done but a little plain, the skulls are sculpted and painted well, but the stand is just awful. I couldn't get the 2 parts to connect together and the mini-poster (made of a thin card and taped to the package) tore as I tried to remove it. I'd always been apprehensive about McFarlane figures in the past after hearing about the poor quality of some of the figures. Well, I guess I was right to be cautious. The figure felt very light and cheap, and I was rather scared to move some of the joints for fear of breaking them. The shoulder tubes are also very fragile, and wouldn't stand up to much handling. You certainly couldn't play with this figure. I paid �11.99 (British) for this. Most figures I buy are between �8-12 so I guess this isn't bad, although if you knock a couple of pounds off then I'd add an extra star. This is the best T-800 figure I've ever seen. The detail is just amazing, as is the articulations. But it's not perfect. It's too fragile, and rather light on accessories. Still, I'm sure that it'll be the biggest seller from this wave of Movie Maniacs, and it won't just be Terminator fans that pick this up. This is already one of my favourite figures of the year, and if it weren't for the Marvel Legends line this would probably end up in my top 3.
goes by that I don't wish I still had them..